Amid rising energy prices and declining energy resources, energy-efficient homes are a key step toward a sustainable future. Heating & cooling energy represents 75–85% of the total lifecycle environmental impact of a building in Canada, so our singular priority for achieving sustainable buildings must be a dramatic reduction in their energy use. Passive Houses are real homes that simply leave small energy footprints. 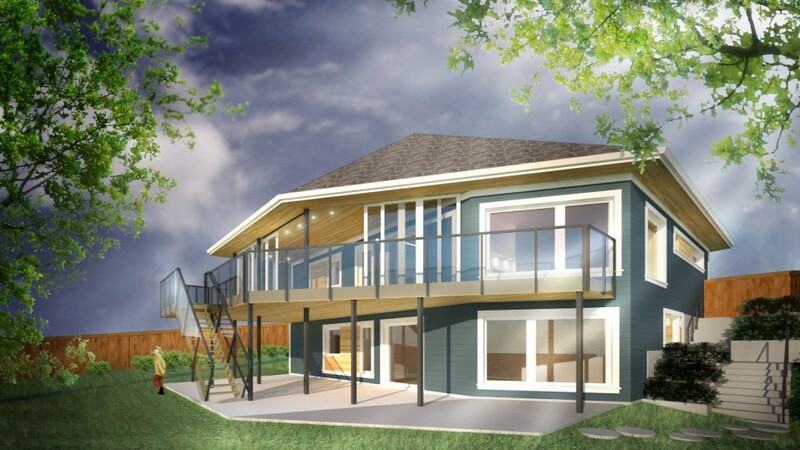 Passive Houses are realistic, achievable projects in Canada. With a bit of advance planning, ongoing discussions with municipalities and open-minded construction partners allow Passive Houses to be built, raising the bar for all future construction. Documented, established precedents like the Cottonwood Passivhaus lay the groundwork for more Passive Houses in Canada. If you’d like more detail, here’s the full story about why the Zeibin family wanted to build a Passive House, in their own words. While the Cottonwood Passivhaus appears quite normal and makes the most of conventional construction materials and techniques, it is different in a few very important ways. The most efficient configuration is the one that maximizes internal volume and floor area while reducing exterior surface area. This maximizes usable space while minimizing the amount of envelope that energy can flow through. The more compact, the better. Passive solar gains play an important role in offsetting energy demands required for space heating. Proper solar orientation and consideration of window placement are critical concerns. For example, windows on the north exposures need to be minimized. Wall, foundation, and roof assemblies are insulated to a minimum of R-38, often higher! Windows can represent 50% of typical heat losses. Passive Houses use high-insulating windows that also allow solar heat gain to heat the house passively and offset energy demand. Argon-filled, triple-glazed windows with insulated frames are a necessity to meet the standard in Canada. The standard requires less than 0.6 ACH (4-5 times less than typical construction) to minimize heat loss from air infiltration and to prevent moisture damage. In the Cottonwood House, this is achieved using a combined air/vapour barrier constructed using a layer of OSB sealed at all joints using special airsealing tape imported from Europe. Typical air/vapour barrier techniques in Canada using polyethylene sheeting can rarely meet the airtightness requirements. A heat recovery ventilator (HRV) is used to recover heat from exhaust air, again offsetting energy demands for heating. In our case, a high-efficiency hot water boiler plays three roles: (1) providing domestic hot water, (2) driving hydronic (hot water) radiators used for heating, and (3) providing pre-heat to the HRV to warm incoming air. Thermal bridges are places where heat can travel quickly and easily through the building envelope — not unlike a hole in a bucket. These thermal bridges often occur at places like the perimeter of a window opening, where a floor intersects an exterior wall, or where a beam passes continuously from the interior to the exterior. Conventional construction often pays little or no attention to thermal bridging, which can amount to huge energy losses and potentially cause condensation on the interior leading to other problems. However, Passive Houses are required to have thermal-bridge-free construction, or factor all thermal bridges into the heat loss calculations. The result is a house of remarkable energy efficiency at relatively modest additional cost. If the house succeeds in achieving certification, it will be one of the first certified Passive Houses in Alberta and one of the most northern Passive Houses in Canada.